How badly can the Trump Administration corrupt the United States? Badly, and in unprecedented ways. 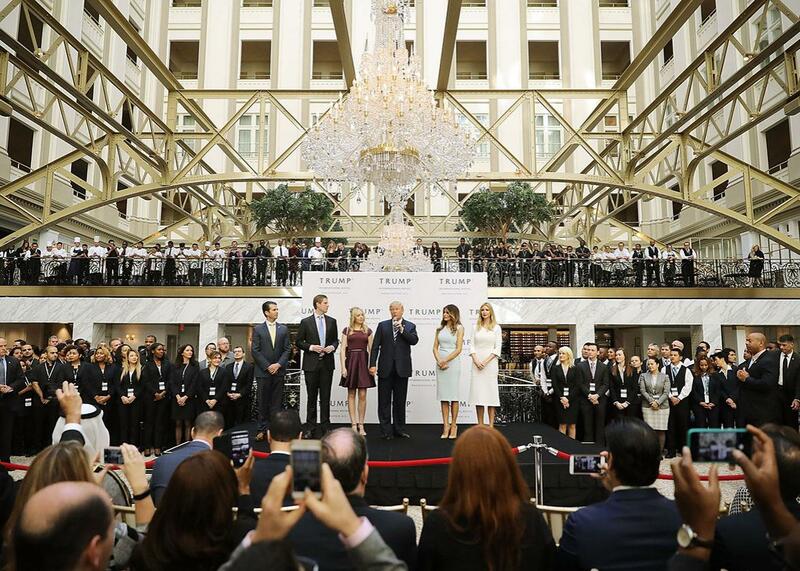 Donald Trump and his family prepare to cut the ribbon at the new Trump International Hotel in Washington, D.C., on Oct. 26. In a classic 1974 essay, Stanford economist Anne Krueger coined the term rent-seeking society to describe economies where profits are earned by securing favorable regulations or contracts from government (i.e., rents) rather than creating goods or services that boost economic productivity and improve the happiness and well-being of citizens. She drew her examples from India and Turkey, mentioning the United States only in her conclusion, where she noted that, whatever lobbying and currying of favors goes on in Washington, America is by and large a nation where success is dictated by merit rather than connections. That was then. In the weeks since Election Day, we’ve seen troubling signs that America’s president-elect will not hesitate to exploit his office for private gain. We’ve seen a reception for foreign diplomats at Donald Trump’s Washington, D.C., hotel; the Indian condo deal; pressure to keep wind farms from obstructing the view of Trump’s Scottish golf course. While hardly unprecedented in modern American politics, the sheer scale and global reach of Trump’s potential conflicts of interest threaten to turn the U.S. into a society of rent-seekers rather than innovators. One mistake in estimating the cost of corruption is to imagine that it largely consists of the value of bribes paid, lobbying efforts exerted, or ill-gotten profits obtained. Sadly, as Krueger pointed out, this represents only the smallest fraction of the full harm. That’s because, once rent-seeking becomes the way to get ahead, it changes the way a society is organized. Companies that offer quid pro quos to win contracts drive their more honest competitors out of business, allowing the crooked companies to monopolize their markets. Public officials write rules with the express purpose of wrapping businesses in red tape, forcing them to pay yet more bribes to avoid pointless bureaucracy. And once it’s known that government jobs can be a source of enrichment, those positions attract candidates whose primary goal is personal profit rather than public service, leading to less scrupulous officials. While some think this is already the way things work in American politics, there’s a lot more money to be made on Wall Street or in Silicon Valley than on Capitol Hill. Americans whose primary goal is personal wealth make a beeline for banking or the startup scene, not for public office. But consider the innovators of tomorrow. In an increasingly corrupt society, there’s better money to be made by favor-seeking than coming up with next breakthrough, which could mean we get fewer Apples and Googles and more back-scratching in Washington. (The potentially large impact of this “talent allocation” effect was observed in a 1993 paper titled, “Why Is Rent-Seeking So Costly to Growth?”) Once the distortions pile up, you end up with cases like Liberia’s Charles Taylor, who destroyed his country through violence and corruption. To be clear, we aren’t suggesting that the U.S. could turn into a banana republic overnight nor that we’ll see plummeting enrollments in computer science or a collapse of the Bay Area tech industry as an immediate result of a Trump presidency. But we do think that a shift to the kind of self-enriching society of middle-income (and corrupt) countries like Brazil or South Africa is within the realm of possibility. Of course, Trump is hardly the first self-serving politician to come to power in America. Rent-seeking is already institutionalized in Washington. Lobbying is very, very big business and has been for quite some time. Although lobbying and lavish campaign contributions don’t break any laws, they can help businesses push for policies that serve their financial interests rather than the public good. As Trump supporters are fond of pointing out, the companies that paid Bill Clinton hundreds of thousands of dollars a speech while his wife served as secretary of State might have hoped to buy access to power. Even if the Clintons never made any promises to return the favor, at a minimum this created an appearance of quid pro quo that tainted Hillary Clinton’s candidacy. Americans can be forgiven for looking at how the politics game is played and viewing Washington cynically. On the one hand, the visibility of Trump’s conflicts allows them to be better monitored by the media, the judiciary, and, one hopes, the U.S. Congress (though nothing to date suggests that enough Republican lawmakers will take up the mantle to make congressional oversight effective). But the conflicts also send a troubling message to Americans about what constitutes appropriate behavior. People take their cues from their leaders. Trump’s values threaten to become society’s values; what was previously unacceptable becomes the norm. (To the extent that Trump’s political appointments share his views, the danger is that much greater.) And once norms shift, it’s hard to make them go back to the way they once were. Despite pressure from the European Union, neither Italy nor Greece has managed to shift citizens’ attitudes toward avoiding taxes—just one area in which Trump is setting a notably dismal example for his fellow Americans. The greatest threat Trump poses to American society may be that he threatens to make the rest of us more like him.